We are among the well-regarded names in the industry, betrothed in providing Plastic Tray to our esteemed customers. Having a definite quality management system, we are readily engrossed in bringing forth a comprehensive gamut of Plastic Diamond Tray. For fast product bundling, corrugated fiber board provides a perfect base for heavy items and to protect fragile products. 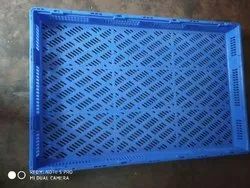 Often used with shrink film, a stock-sized corrugated tray is a great choice for shipping products that require unpacking and individual retail display. Sunpalm Indo Plast Pvt. Ltd.